Building a website: What should you consider? The days when companies could rave about their new website, and expect a round of applause, are long gone. Consumers now simply expect businesses to be online, even if they do not sell directly. An online presence can also raise awareness of the company, provide details of products and services, and act as a channel for customer service enquiries. However, when it comes to digital, some companies still don’t get it. According to the 2015 Digital Business Index, 23% of small businesses lack basic digital skills – that’s 1.2 million companies. At the same time, consumer expectations of businesses’ digital acumen are rising all of the time. In a CapGemini report, Digital Shopper Relevancy, 51% of customers said they would soon spend more money online than in store. Worryingly for digital laggards, a website in itself is no longer enough as 83% of consumers now expect local businesses to have a mobile friendly site (BrightLocal survey). So how do you go about creating a great website, and what do you need to plan for to ensure that your business doesn’t lose pace in the digital race? Read our full list of the UK’s best website builders for small businesses here. Fools rush in, so before starting on what will be a time-consuming and potentially costly exercise, make sure you understand why you’re building a website. Do you want to start selling online or increase your brand and product awareness, for instance? Work out what you want from your website with clear objectives and identify what your customer actually needs. There’s no point in having a website with streaming media and social media feeds if you are a chimney cleaner that simply wants to make people aware of your business and harness leads. Speak to some of your existing customers and find out what they expect online – how will they be accessing your website, via their smartphones, tablets or desktop browsers? There is no point adding expensive functionality that nobody will use, especially if it can be bolted on at a later stage when demand is there. Find out what your competitors are doing online. An online competitor analysis should look at your main competitors, and also those that are being returned against the common search terms you use for your business. There are lots of digital tools that can help you rate the competition online, such as Search Metrics, PR Checker and Google Analytics. Research can look at aspects of your competitors such as how quickly their site loads, their online marketing, social media coverage, and general editorial tone. Building a website can take longer than you expect, and cost more. Having established what you need from your site, you can then get quotes from several companies and ask them for a timeline on the project. Don’t be swayed simply by cost. A cheap service can end up being a false economy if you are left with a dysfunctional, or hard to use site. Look at the work that website builders have done for other companies and ask if you can speak to some of their clients. They should also be able to provide you with some mock up designs for you to get a feel for the quality of their work. It is important to get a feel for how you can work with the company that you hire, as there will be a lot of communication between the two parties over the course of the project. Some aspects, such as design nuances, are very subjective, and it can be hard to explain exactly what it is that you do or don’t like. Remember to build in time for all of the areas where you will require input such as providing content, editing, proofing pages, testing links, and signing off. It can take any time from a couple of weeks to several months to build a site depending on the requirements of the site and your availability. A bespoke website building agency will take your brief, and create a site designed to your exact specifications. 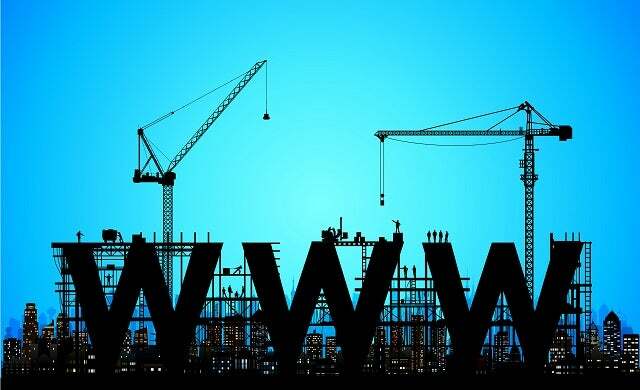 However, you can also go down the DIY route using a third party website building solutions such as 1&1 or Domainmonster.com. A do it yourself (DIY) website builder will be cheaper, but you will have to do more work yourself. However, for a simple website with a few standard requirements, it may be perfectly adequate. Website building tools are fairly intuitive, so you don’t need technical skills and the companies offer support. However, it may be difficult to migrate the site to another host if the business grows or you want to change the site significantly. Functionality may also be limited. With a web designer, you will get exactly what you want and it should save you time that you can devote to other areas of your business. However it will cost more initially, and you may also have to rely on the designer to make changes as your business changes. Choosing a web host is another decision you will have to make. There are hundreds of hosting companies, but they are not all equal. Don’t buy simply on price, but also consider issues such as service levels, reputation, security, ease of contacting the host, and sector expertise. With millions of websites around, the first thing you need to consider when choosing a business name is whether or not the associated domain name and extension you want is available. If you can’t secure your first choice domain name, you will have to be creative. Name suggestion tools can be a great way of testing ideas. If you type in your proposed name, they can suggest available domains that may fit your business’ needs. The best web addresses tend to give a good summary of what the site does, for example, cheaptowels.com. A keyword rich domain name will help to market your company even if people don’t know you exist, as it will turn you up in a search. Another approach is to come up with a creative and catchy name that no one is likely to own, but this will entail a relatively high marketing budget to raise awareness of the new brand. Secure your domain name as soon as you can, even if it’s only for a holding page. A .com domain should always be your first choice for a web address. Not only does it perform well for search engine optimisation (SEO) but it’s likely to be the first domain name your customers will search for if they don’t know the exact web address. That doesn’t mean you should just stick to .com– registering other extensions like .net, .org etc. will also expand your presence on the web. Register the domain name with a reputable company and look closely at what you are being charged, what you are getting, and remember when the renewal date is. No domain name means no business. For start-ups, building your website often coincides with developing your brand, so it essential that both are consistent. A company’s brand is the essence of what the business is all about – what it means, what it does, it’s tone of voice and so on. How you want the company to be projected, and to who, all comes through the brand. Is it a traditional business or more lively and modern? Are you innovative? Do you have specialisms? Once you know what the company brand values are, then it is much easier to come up with a design that reflects these. The design should be in sync with the business, so for example a cupcake business might choose pinks and pastel colours, and vintage fonts, while a cutting edge fashion etailer would have a different colour palette and typography. Remember too that design online isn’t just about the look, but about the overall user experience (UX). The customer needs to be able to find what they want easily and quickly. Test the UX with customers ahead of launch (Beta stage) and make any changes required. You can alter things afterwards, but creating a bad first impression could mean that you’ve lost a customer for good. Check out our full list of the UK’s best website builders for small businesses.